← End-Triassic mass extinction link to CAMP: It’s official? For those of us living in what was the heart of Pangaea – Europe and North America – more than 250 Ma ago this item’s title might seem like the ultimate truism. However, despite our vision of desert dune sands and evaporating inland seas, glaciation blanketed much of the Gondwana part of the supercontinent until the Middle Permian then lying athwart the South Pole. That would go a long way to accounting for extreme dryness at low to mid-latitudes, especially in the deep interior of Pangaea, but just how hot might tropical climates have been? The deglaciation of Gondwana was abrupt and has been touted as an analogue for a possible anthropogenic closure to the Cenozoic glacial epoch that began around 34 Ma in Antarctica and has periodically gripped land at northern latitudes as low as 40°N for the last 2.5 Ma. Since the present distribution of continents is totally different from the unique pole-to-pole shape of Pangaea, that is probably a view that is not widely held by palaeoclimatologists. Nonetheless, getting hard data on Permian conditions has an intrinsic interest for most geoscientists. One of the best ways of measuring past temperatures, whether surficial or deep within the crust, almost directly is based on fluids trapped within minerals formed at the time of interest. In Permian strata there is no shortage of suitable material in the form of evaporite minerals, especially common salt or halite. A distinctive chevron-like texture develops in halite that forms at the water-atmosphere interface in playa lakes that dry out every year. When thin sections of samples that contain fluid inclusions are slowly heated the air bubbles trapped in salt during crystallisation gradually homogenise with the other trapped fluids. Based on samples that have formed at the present day under a range of air temperatures, the temperature of homogenisation indicates the prevailing air temperature accurately. So well, in fact, that it is possible to assess diurnal temperature variations in suitable halite crystals. Results have been obtained from Middle Permian halites in Kansas, USA (Zambito, J.J. & Benison, K.C. 2013. Extremely high temperatures and paleoclimate trends recorded in Permian ephemeral lake halite. Geology, v. 41, p. 587-590). 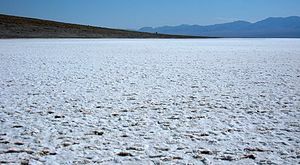 In part of the section studied air temperatures reached 73°C, compared with a modern maximum of 57°C recorded in halites from the playas of Death Valley. Moreover, they exhibit changes of more than 30°C during daily cycles. But that kind of weather is common in other hot dry areas today, such as the Dasht-e Lut in eastern Iran. Also, the full data show crystallisation at lower temperatures (maxima of 30-40°C) in part of the sequence. What is noteworthy is that these data are the first quantitative indicators of weather before the last 2.5 Ma. Since evaporites extend back into the Precambrian, the method will undoubtedly extend accuracy and precision to paleoclimate where only proxies and a modicum of guesswork were previously available. This entry was posted in Climate change and palaeoclimatology and tagged climate change, Global warming, Pangaea, Permian climate. Bookmark the permalink.